I swear that last week, I wrote a list of all the things I was going to make. And having reviewed what I've actually made, I've managed to miss out falafel and a turkey and mushroom dish. Goodness knows what I had slated for today - the list was on a post it note on my desk somewhere. Quite frankly, I am really rubbish at planning for this blog unless it's cake related. Realising my error, fool that I am, I settled on making myself a nice warming bowl of 'red' soup for lunch. After a chilly six mile run before 7am, and still not having warmed back up at 1pm tonight, I knew soup would do the trick, only to go to the store cupboard and find that I don't actually have anything 'red' to make it with. Namely chopped tomatoes. I found six cans of tuna, five cans of assorted pulses, a tin of condensed milk, some Heinz tomato soup (shudder - it's the husband's), two tins of Branston beans (mine), a tin of Heinz beans and mini reclaimed meat batons (okay they're supposed to be mini sausages, also the husband's) and assorted tins of fruit. An emergency search on the BBC Good Food website and reccy of my meagre fridge contents turned up the idea of bacon, bean and pasta soup. Hearty, low fat, and red - through the use of tomato puree. Thankfully I had just enough of that left. Really liked this soup. 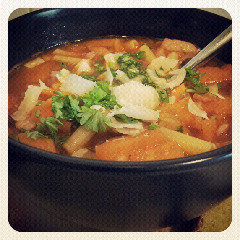 It's a great alternative to bog standard minestrone and a really good way to use up random things from the fridge. Not much else to say about it really other than I'm sure it will get me out of a hungry hole some other day in the future.